We specialize in assisting home owners sell their home for less than what is owed, with a concentration in the VA Compromise Sale Program, FHA short sales, and conventional mortgages with more than one lender. Since 2009, we’ve closed an average of 12-14 short sales annually allowing homeowners who are upside down in their mortgage to sell for less than what they owe. And in most all cases, our clients brought very little or no money to the closing either (cases where sellers brought money to the table were due to cloudy title issues or delays in a closing). When selling as a short sale, the homeowner’s lender/bank pays for all of a seller’s closing costs including listing commissions, deed prep, title exam, and unpaid property taxes. Depending on the type of mortgage a homeowner has, the seller’s lender may also pay up to 3% of the purchase price in buyer’s closing costs. In turn, and monies a seller may have in escrow (which is typically sed to pay property taxes for a home owner) is retained by the bank. A small trade off for not having to pay the $10,000 to $25,000 in closing costs a typical home seller incurs. We’ve closed short sales with Bank of America, Chase, Freedom Mortgage, GMAC, Greentree, Nationstar, Nationwide, Navy Federal Credit Union, Ocwen, SunTrust, U.S. Bank, VHDA, Wells Fargo, WestStar, and many more. We employ the use of an experienced real estate attorney and short sale team to help ensure your foreclosure is delayed, so you have the opportunity to get your home sold fast, and at no cost to you! How will selling as a short sale affect my credit scores? If you are current with all of your financial obligations (car payments, credit cards, etc), previous clients reported their scores only dropped by 35~55 points, but quickly rebounded in 30-60 days after closing. If you have an FHA insured mortgage, HUD requires sellers are at least 30 days late in paying their mortgage by the time the short sale closes. That will understandably affect your credit score, but not nearly as much if you were to allow the property to go into foreclosure (which is the same as a Deed in Lieu of Foreclosure). If you are selling under the VA Compromise Sale, you do not have to be late in your payments to qualify however, any late payments will naturally affect your credit scores but still, not nearly as bad as a foreclosure. I have a VA mortgage. How will it affect my future VA mortgage privileges? Under the VA Compromise Sale Program, your mortgage company will agree to accept approximately 83% of the loss at closing, which allows sellers some wiggle room for negotiations an offer from a buyer. As long as the VA seller can provide a hardship such as PCS, employment transfer, medical hardship, or becoming inactive military, your lender will likely agree to the short sale. In our experience, we have a 100% track record of closing all of our VA Compromise Short Sales. Although veterans are not allowed to borrow against that deficiency until that portion is repaid, veterans are not required to repay that deficiency either. Consequently, many previous short sale veterans simply decide to purchase a new home using an FHA or conventional mortgage product. Can my mortgage company make me cash out my Roth or IRA investments? No, only the IRS can demand such actions. We have seen other short sale clients move large cash savings into IRA’s or similar before going through the short sale process, as lenders may try to have you contribute some cash to the closing if they see $60,000 or $150,000 in your savings account. But we always recommend that you contact your financial adviser or CPA for more concise information and recommendations. I have no money. How does everyone get paid? Your mortgage company (bank) pays for all of your listing fees, commissions, grantor’s taxes, seller’s closing attorney fees, etc. And in many cases, your lender may also agree to pay up to 3% of a buyer’s closing costs too. Every mortgage company has different guidelines they must adhere to based on the type of mortgage you have. Sometimes a lender will pay a buyer’s closing costs, but they will not pay for the buyer’s title insurance policy (which is typically part of a buyer’s closing costs). 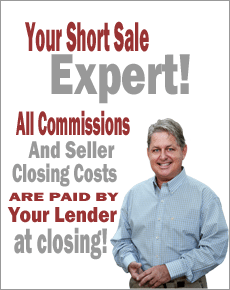 I have a conventional mortgage – can I still sell as a short sale? If you have a conventional mortgage, your lender will likely agree to your short sale based on your hardship. Lenders will also consider your home’s value as well and if your home is worth $75,000 less than when you bought it, your lender is holding a note that is worth $75,000 less – and that’s not good for the lender’s portfolio or their investors. For example, if your mortgage company tried to sell your mortgage to another investor or lender, that investor would likely not be interested in paying $275,000 for a mortgage that is only worth $200,000, and so that also influences the lender decision to pre-approve your short sale. An important note needs to be made regarding conventional mortgages. We once assisted a seller who had about $60,000 in his savings account. This seller involuntarily lost his job. He had to move to Arlington for new employment, plus he suffered a slight loss of income. But when the investor saw the borrower’s savings account balance, the lender demanded the seller contribute $5,000 cash at closing to help pay for some of the seller’s closing costs. The seller’s mortgage was about $120,000 upside down so although it was a financial shock to the seller to have to bring cash to closing, we eventually negotiated that down to $3,000. Although that was a shock to the seller, we reminded the seller that he did not have to pay the approximate $18,000 in listing fees, closing costs, and unpaid property taxes associated with his $245,000 sale, so bringing $3,000 to closing was a lot less expensive than to pay $18,000 at closing. In another recent example in 2015, we had a borrower who was approximately $80,000 upside down in his mortgage, but his family was suffering a great financial and medical hardship. However, several years before their hardship, the borrowers took out an equity line of credit as a second mortgage for about $60,000. This line of credit was taken out before their financial and medical hardships. However, after the first lienholder agreed to the short sale, the second lienholder demanded the seller repay the entire $60,000 back to the lender. This of course was not an option for the sellers and after several days of negotiations, the junior lienholder offered the seller to repay $9,000 at zero-percent interest over 10 years at $75 a month. This is what’s called a promissory note, and this offer was an amount the borrowers could live with. That smart decision ultimately allowed those sellers to walk away from an $80,000 deficiency, plus a $51,000 equity debt, plus the sellers didn’t have to pay the approximate $21,000 in listing fees, closing costs, and unpaid property taxes either! How do I start the short sale process? Contact us as soon as you know you will be relocating out of the area (PCS or job transfer), or as soon as you are beginning to face a financial hardship. We’ve had clients contact us when they’re already 7 months behind in their mortgage payments and have already received pre-foreclosure notices and that simply makes negotiating your short sale a lot more difficult, if not impossible. Our team recently saved an FHA mortgage from active foreclosure that was already 7 months late, but it almost didn’t happen. We know it’s tough to admit that you may be in financial trouble, but do not procrastinate as it will make your situation worse. Will my mortgage company make me repay them the shortage or difference? Sellers with VA or FHA insured mortgages are not allowed to repay any of the shortage and with an insured conventional mortgage, the seller will likely not be required to bring cash to closing, but that will depend on a lot of factors such as, does the seller have a large amount of cash in their savings; did the seller place 10% to 20% down when they bought the home, etc. An uninsured conventional mortgage is the most difficult short sale to negotiate, but not impossible. With uninsured conventional mortgages, it’s extremely important to discuss your situation with a real estate professional in advance, and then also map out a comprehensive plan that will place you in the most favorable position in the eyes of your lender and their investors. Again, VA and FHA insured mortgages are the best type of mortgages to try and short sale, as they are insured and the lender will recoup about 83% to 85% of the losses from the government after closing. With uninsured mortgages, the individual lender is taking the entire loss. VA short sales allow the veteran to basically walk away from any financial liability, but the veteran is not allowed to use that portion of their loan privileges until the deficiency is repaid to the Department of Veteran’s Affairs. However, the veteran is not mandated to repay that deficiency ever, so many of our veterans have simply chosen to use an FHA or conventional mortgage when purchasing again in the future. When selling as a VA Compromise Short Sale, the seller is never allowed to bring money to the closing table (unless past due condo or association fees are due). IMPORTANT NOTE: Mortgage lenders will never pay for a seller’s past due condo or association dues so if you live in a condo or homeowner’s association and you owe the association hundreds or thousands of dollars in past due fees, those fees MUST be paid before you are able to sell as a short sale – even if your lender has approved the short sale! Condo and HOA associations have the legal right to stop a short sale, but they are also willing to negotiate with sellers too; agree to a promissory note, agree to accept a lessor amount, etc. If you live in a community with monthly association or condo dues, call us to discuss a strategy to work through repaying those fees as soon as possible. Borrowers who have chosen to do a Deed in Lieu of Foreclosure and walk away from the short sale completely does not absolve you from having to re-pay those past due condo fees, and some sellers who got foreclosed upon reported to us reported to us that the association will pursue those past due amounts under collection laws – like a past due credit card payment. We’ve had client report that their wages were garnished after doing a Deed in Lieu of Foreclosure, so taking care of past due condo and association fees is paramount in order to proceed with a successful short sale closing. We realize this it’s a very tough and complex decision to try and make on your own so even if you simply have questions about the short sale process, or anything short sale related, please contact us anytime – we will be happy to answer your questions for free – no cost or obligation ever! Short Sell My House Now!